The Insider Monkey team has completed processing the quarterly 13F filings for the June quarter submitted by the hedge funds and other money managers included in our extensive database. Most hedge fund investors endured a torrid quarter, which certainly propelled them to adjust their equity holdings so as to maintain the desired risk profile. As a result, the relevancy of these public filings and their content is indisputable, as they may reveal numerous high-potential stocks. The following article will discuss the smart money sentiment towards Franklin Resources, Inc. (NYSE:BEN). Hedge fund sentiment towards Franklin Resources, Inc. (NYSE:BEN) ticked up in Q2, as the holding company remained a popular pick among the leading money managers tracked by our custom database, who owned 7% of Franklin’s shares. The company’s impressive history of paying dividends surely enticed some hedge funds, as Franklin landed 13th on our list of the 25 Best Dividend Stocks for Retirement. 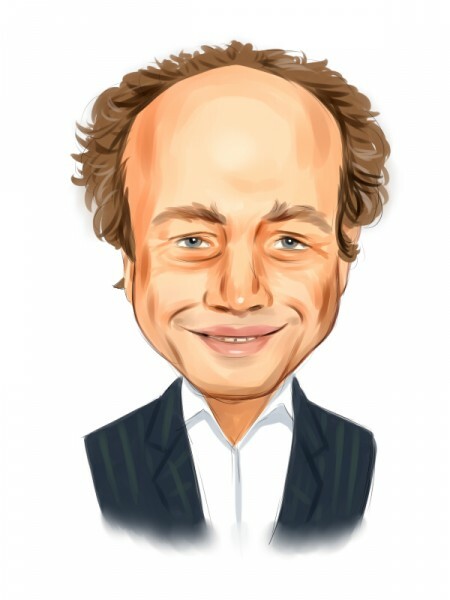 How are hedge funds trading Franklin Resources, Inc. (NYSE:BEN)? At Q3’s end, a total of 33 of the hedge funds tracked by Insider Monkey held long positions in this stock, a climb of 10% from one quarter earlier. 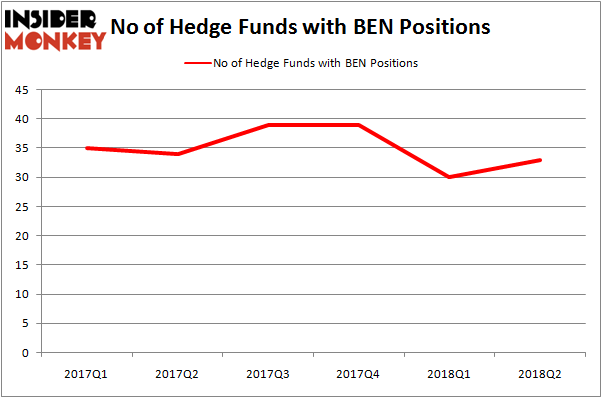 Below, you can check out the change in hedge fund sentiment towards BEN over the last 6 quarters. So, let’s review which hedge funds were among the top holders of the stock and which hedge funds were making big moves. The largest stake in Franklin Resources, Inc. (NYSE:BEN) was held by Pzena Investment Management, which reported holding $337.5 million worth of stock as of the end of June. It was followed by David Abrams’ Abrams Capital Management with a $254.6 million position. Other investors bullish on the company included Highfields Capital Management, Sprott Asset Management, and Polaris Capital Management. As one would reasonably expect, specific money managers were breaking ground themselves. Clinton Group, managed by George Hall, assembled the most outsized position in Franklin Resources, Inc. (NYSE:BEN). Clinton Group had $1 million invested in the company at the end of the quarter. Jim Simons’ Renaissance Technologies also initiated a $18.7 million position during the quarter. The following funds were also among the new BEN investors: Michael Platt and William Reeves’ BlueCrest Capital Mgmt., Bruce Kovner’s Caxton Associates LP, and Peter Rathjens, Bruce Clarke and John Campbell’s Arrowstreet Capital. Let’s go over hedge fund activity in other stocks similar to Franklin Resources, Inc. (NYSE:BEN). We will take a look at W.W. Grainger, Inc. (NYSE:GWW), Lennar Corporation (NYSE:LEN), Spectra Energy Partners, LP (NYSE:SEP), and Harris Corporation (NYSE:HRS). All of these stocks’ market caps resemble BEN’s market cap. As you can see these stocks had an average of 29 hedge funds with bullish positions and the average amount invested in these stocks was $1.17 billion. That figure was $1.21 billion in BEN’s case. Lennar Corporation (NYSE:LEN) is the most popular stock in this table. On the other hand Spectra Energy Partners, LP (NYSE:SEP) is the least popular one with only 6 bullish hedge fund positions. Franklin Resources, Inc. (NYSE:BEN) is not the most popular stock in this group but hedge fund interest is still above average. This is a slightly positive signal and a stock that dividend investors should certainly give a look.